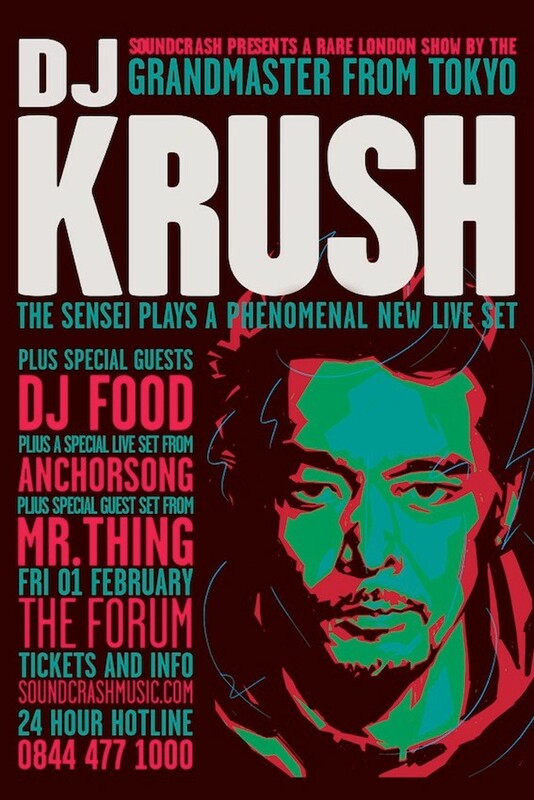 DJ Krush is coming to The Forum in London for a rare show on February 1st, an all-too-rare showcase of his unique brand of dark, multi-textured beats, with audiovisual delights and DJ support coming from DJ Food, Anchorsong and Mr Thing. Tokyo-born DJ Krush is best-known for his unique approach of instrumental hip hop, having taken the genre to a different level, his influence on some of today’s brightest stars is well-documented. Krush’s influence is evident in the West Coast hip hop championed by the Stones Throw and Brainfeeder crews, as well as new the likes of Shabazz Palaces and Ratking. Today, as relevant as he ever was, DJ Krush rarely tours, but when he does he delivers a masterclass in layering, beat manipulation and generally ripping places to pieces. 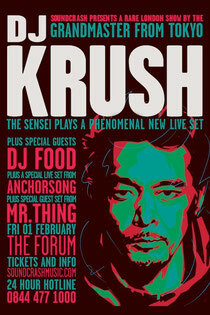 Joining DJ Krush is DJ Food, an electronic music phenomenon whose current incarnation is headed by Ninja Tune stalwart Kevin Foakes, aka Strictly Kev – designer, producer, DJ and DJ extraordinaire who encapsulates the Ninja Tune ethos to perfection in his eclecticism, vast musical knowledge, well-honed skills and forward-thinking approach. Live support comes from Tokyo’s Masaaki Yoshida, better known as Anchorsong. A true technician, Anchorsong’s sets are evolutionary, and with a new album on the horizon you can expect a truckload of new material on the night.